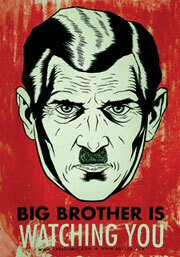 Big Brother is a fictional character and symbol in George Orwell's novel Nineteen Eighty-Four. He is ostensibly the leader of Oceania, a totalitarian state wherein the ruling party Ingsoc wields total power "for its own sake" over the inhabitants. In the society that Orwell describes, every citizen is under constant surveillance by the authorities, mainly by telescreens (with the exception of the Proles). The people are constantly reminded of this by the slogan "Big Brother is watching you": a maxim that is ubiquitously on display. In modern culture, the term "Big Brother" has entered the lexicon as a synonym for abuse of government power, particularly in respect to civil liberties, often specifically related to mass surveillance.